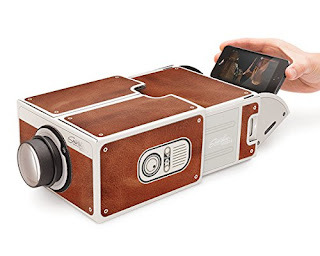 What do you think of this Smart Phone Projector? Turn your smartphone into a projector! Sit back, relax, grab some popcorn and let the Smartphone Projector transform your wall into a cinematic experience. Easy to assemble and can be collapsed and reassembled so you can slip it into your backpack and take it over to a friend's house. Fun modern idea encased in cool retro styling. Why not invite friends over and have a garden party with a difference! Suitable for use with iOS and Android compatible smart phones. BONUS QUESTION! Who has the best price? Today it is definitely the US Amazon site - discounted by 38% off!